What better way to celebrate Christmas, than with a crowd of fellow Creative and digital business from around the region. 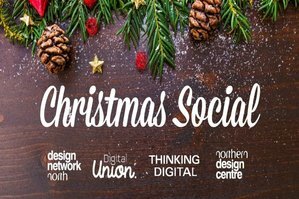 As we are firm believers in the powers of collaboration, this year Design Network North have teamed up with Digital Union, The Northern Design Centre and Thinking Digital, to make it an extra special event for all our members and associates. With live music, good beer, delicious food vendors and a variety of design led gift stalls all from local businesses, we will be transforming the Northern Design Centre into a fully festive Christmas market for one night only. So join us for what we hope will be an opportunity to network with lovely like-minded people, buy some last minute presents, enjoy live music, drink some great beer, eat some tasty food, and be full of festive cheer! Tickets are free to Design Network North members, Digital Union members and Northern Design Centre residents, so get in touch to access your discount codes. For those of you who are not currently members but want to come along for the jolly, it will cost you £10. Food and a welcome drink will be provided to all those attending, with bars being operated by local breweries and drinks producers for the rest of the evening.